Danny Peterson | 4/18/2018, 12:08 p.m.
Dr. LeRoy Haynes Jr. (left) and Dr. T. Allen Bethel of the African American Ministerial Alliance’s Coalition for Justice and Police Reform. 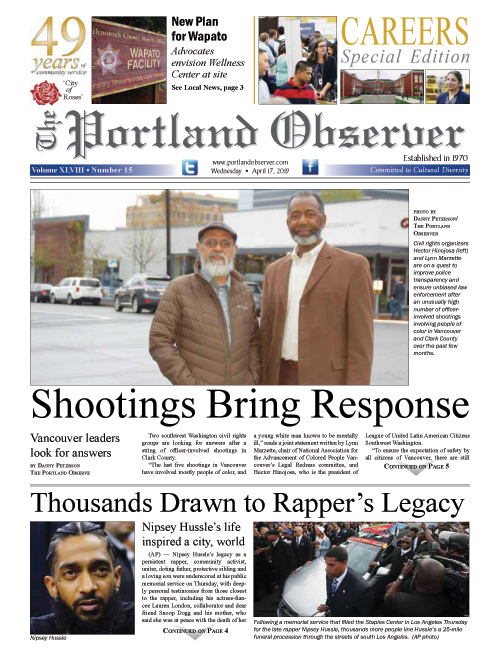 Federally mandated reforms to better protect people with mental disabilities from being shot by police during a disturbance appear to have fallen short of preventing the recent deadly officer involved shooting at a southeast Portland homeless shelter, according to the Albina Ministerial Alliance, the civil rights advocacy group from the African American community. The Alliance’s Coalition for Justice and Police Reform, released a statement Thursday critical of Portland police in the shooting of a 48-year old man wielding a knife who appeared to be having a mental health crisis. “Although all the facts of this deadly force shooting are not in and the investigation is not complete this case could possibly be a major step backward for the Portland Police Bureau in the use of ‘excessive force against persons with actual or perceived mental illness,’” the statement read. The coalition was a party to a settlement agreement with U.S. Department of Justice four years ago that, after a 2012 federal investigation, found Portland police were using excessive force against them mentally ill people. John Elifritz was fatally shot by police April 7 at City Team Ministries after appearing to have had a mental health crisis earlier in the day, authorities said. Police said he refused to drop a knife he was wielding after he burst into the homeless shelter during an Alcoholics Anonymous meeting without a shirt on and was cutting himself. At the time, he was a suspect running from a car-jacking and attempted carjacking and road-rage incident, crashing a stolen vehicle. Elifritz contacted 9-11 earlier that afternoon and a police officer encountered him in outer East Portland with a knife he held at his own throat. The officer let Elifrtiz back away and escape, referring the case to the bureau’s Behavorial Health Unit for follow up. Social media posts from his friends family indicated he was having a mental health crisis the week leading up to the confrontation. Elifritz had also spent several years in prison and once self-identifed as a member of a white supremacist prison gang, European Kindred, according to a 2007 Portland Monthly article that interviewed him. The coalition also criticized the police bureau’s decision to not release the names of the seven officers and one Multnomah County sheriff’s deputy involved in the shooting for nearly three days. The police cited threats against officers’ lives, but exceeded the mandatory 24 hour wait time for police-involved fatal shootings instituted by City Council last year. At least two other officers involved in the shelter confrontation have gained media attention in the past for their conduct: Chad Phifer was cited in the 2012 federal investigation for firing a Taser at a man who had a mental illness and Bradley Nutting hit a bicyclist with a stun gun six times in 15 seconds.